Dr. Irwan Meilano, S.T., M.Sc. Dr. Ir. Dina A. Sarsito, MT. Dr. Ir. Agustinus Bambang Setiyadji, M.Si. as a method for the detection of geothermal activity that related to deformation. a starter for other geothermal field cases in Indonesia. 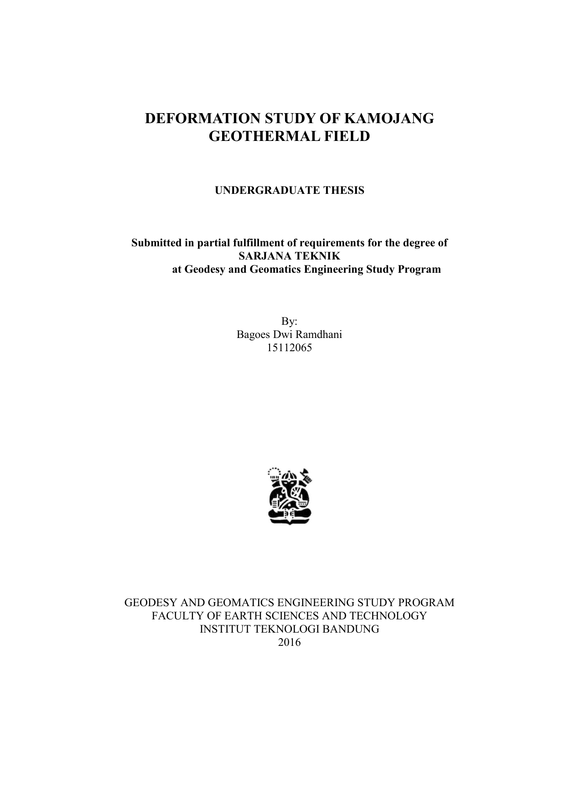 “Deformation Study of Kamojang Geothermal Field”. knowledge that help author accomplish this undergraduate thesis. Tanuwijaya, M.Si. for being examiners of this undergraduate thesis. author’s study and in processing this undergraduate thesis. supervision during this undergraduate year. single lectures activity on this campus. studying together in the UTM, Johor Bahru. the world, best pasrtner in IGEO team. the study on this campus. Family. “Kami Geodesi 2012, HA!!”. to get this valuable data. you for this valuable time. the SPPD and bill from the survey. the Kamojang Team in to the site. for author share everything. Angel of my heart, Nur Azmina. Love you. Geothermal Power Plant (PLTP) (Pandu, 2014). potential in geothermal site Kamojang. Figure 1.1 Location of Kamojang Power Plant next to Guntur Volcano. another geothermal site in Indonesia to optimize the geothermal potential. displacement with geothermal activity at Kamojang. data and Periodic GPS data. (Center of Geothermallogy and Geological Hazard Mitigation – PVMBG). 4. Determine the displacement caused by geothermal activity at Kamojang. journal, scientific presentation, other relevant websites. 2. Survey planning and development of GPS network point. 3. Collecting data GPS campaign of the network from March to April in 2016.
as a reference site, data can obtain from www.igs.org. observation point in the time domain. 7. Time series Plotting to remove outlier data. Calculation displacement refers to deformation model. methodology and undergraduate thesis writing systematics. subsurface fluid reservoirs (Fialko, 2000). deformation (e.g., Wairakei, New Zealand (Allis et al, 1998); Geysers, U.S.A.
fluid extraction cools the reservoir, causing further volume reduction and deformation. ground surface, causing both vertical and horizontal ground displacement. along faults, leading to activation of seismicity (Narasimhan and Goyal, 1984). Figure 2.1 Location of Kamojang Geothermal Field. located in the Kamojang creature area. network around Kamojang Geothermal Field. Figure 2.2 Location of GPS baseline around Kamojang Geothermal Field. 1. The composition of concrete mix with cement: sand: gravel = 1: 2: 3. 2. peg made of concrete with reinforcement iron P8. 3. Amid still mounted screws with a length of 10 cm and a diameter of 2 cm. 4. The overall height is 150 cm stakes (20 cm above the surface, buried 130 cm). the basis of sand excavation by 20 cm. P-code and C/A-code alongside with carrier phase (φ) from L1 and L2 carrier wave. that are combined to form equation (2) below. be categorized into two types which are the absolute method and differential method. Difference (DD) between two receivers and two satellites. is POST. POST is located in Observation Base of Guntur Volcano in Garut, West Java. Figure 2.5 show the distribute of observation point at KGF and CGPS PVMBG. data. Navigation data includes information of satellite orbit. Deformation analysis is the study of the shape changes of an arbitrary body in time. The approach must depend on the desired results and the available measuring devices. epochs is the result of interest. analysis uses the position difference of an object from time to time. observations or derived from the displacement of an object. Figure 2.7 Pressure Change of Hydrostatic. take into account the correlations that are introduced in the differencing process. to obtain final estimates. (Herring et al, 2010a). et al., 1993; Dong et al., 1998). in a geocentric system (X, Y, Z). for the GPS analysis includes directory names and some processing control. coordinates constraints and atmospheric models. plotted in the form of time series plotting to see the displacement of those points. points only affected by block motion and the 2012 Sumatra earthquake effect. referencing observation points to CGPS BIG. applied to the calculation of Easting and Up component. can be done by using equation (6) and (7). (8) are applied to the calculation of Easting and Northing component. alternative hypothesis (𝑉𝑟 ≠ 0) means that the displacement was significant. (Arman, 2015). The test used in this research shown in Equation (11). value that will be explained by equation (12) below. locations to represent the dynamics of the surface of Kamojang Geothermal Field. Process generating GPS baseline Kamojang show in Figure 3.1.
epochs (March 5th, March 25th, and April 15th). Figure 3.2 Time series file (.pos) of KMJ1 station. BIG derived from the data processing using GAMIT 10.5 can be seen in Table 3.1.
processing are listed in Table 3.2. Table 3.1 List of GPS observation points’ coordinate. Table 3.2 Standard deviation of topocentric coordinates. PVMBG POST show in Figure 3.6 by blue dot. Figure 3.3 KMJ1 time series. Figure 3.5 KMJ3 time series. Figure 3.6 POST time series. station were enclosed in appendix A. Table 3.3 Referencing result relative to POST. tectonic activity around the area. as sequence’s in North-South component and East-West component. Figure 3.7 Displacement plotting of North-South Component. Figure 3.8 Displacement plotting of East-West component. observation that shows better quality than observations that have large RMS value. distract the signal of the satellite to the receiver as we known as multipath effect. Figure 3.9 will show the situation around KMJ5 site. Figure 3.9 The situation around KMJ5 site. Figure 3.10 Displacement of observed pint. Geothermal Field. This test was done by applying Equation (5) until Equation (9). significant enough to cause deformation on Geothermal Field. The results of the tstudent test on the result of this research respectively shown in Table 3.4. Table 3.4 t-students statistical test result of the displacement values. Figure 3.11 Displacement vector of Campaign observed point. The Subsurface model of Kamojang Geothermal Field is show in Figure 3.12 (PT. Figure 3.12 MT model of Kamojang Geothermal Field. (PT. LAPI, 2012). Figure 3.13 Location of reservoir. 3.15 and Table 3.6 for the west reservoir. pressure (a) variance for east reservoir. Figure 3.14 Change of pressure and residual variance chart east reservoir. pressure (a) variance for west reservoir. Figure 3.15 Change of pressure and residual variance chart west reservoir. Table 3.7 Residual of change pressure in east reservoir. Table 3.8 Residual of change pressure in west reservoir. the residual, so the best fit value of pressure change in the east reservoir is 20 Mpa. Figure 3.16 Displacement model of east reservoir. Figure 3.17 Displacement model of west reservoir. Table 3.9 Displacement model resultant. the observation by black arrow is show in Figure 3.16. Figure 3.18 Displacement by model and observation. optimal result to justify the phenomenon of deformation. formation of GPS baseline, displacement, and the deformation analysis. needed in the western part of Kamojang. west reservoir due to resultant displacement from both reservoirs. the region continuously and can be a reference point in its processing of GPS data. this GAMIT 10.5 software is considered for the future research. Abidin, H. Z. (2007). Penentuan Posisi dengan GPS dan Aplikasinya. Jakarta: PT. Abidin, H. Z., Andreas, H., Kato, T., Ito, T., Meilano, I., Kimata, F., ... & Harjono, H.
Earthquake and Tsunami, 3(02), 77-88. Wairakei Field, New Zealand, Geothermal Resources Council Trans. 22, 43–47. Oct.31-Nov.1 (pp. 170-206). Boston: Proceedings (MIT). movements using fault crossing geodetic surveys. Tectonophysics 97, (pp. 297315). Geysers Geothermal Area, California, J. Geophys. Res. 89, 1191–1207. Esposito, A., Anzidei, M., Atzori, S., Devoti, R., Giordano, G., & Pietrantonio, G.
hydrothermal/geothermal system (Aeolian Islands, Italy) from GPS data. Bulletin of Geothermallogy, 72(5), 609-621. Geophysical Research Atmospheres, 98, 21677-21722. Satellite Radar Interferometry, J. Geophys. Res. 195(B9), 21,781–21,793. Analysis, Fourth Edition. New Jersey: John Wiley & Sons, Inc.
Great Basin. Geothermal Resources Council Transactions, 31, 391-395.
areas in West Iceland and tectonic interpretation. resources. Geothermal Resources Council Transactions, 30, 441-446. Meilano, I. (1997). Deformasi Gunung Guntur Berdasarkan Pengamatan GPS. Undergraduate Thesis of Geodesy ITB. Mossop, A., & Segall, P. (1997). Subsidence at The Geysers geothermal field, N.
(Geol. Soc. Am., Boulder, Colorado 1984), pp. 35–66. PT. LAPI – ITB, (2012). Kajian Prospek Panas Bumi di Daerah Jawa dan Bali. Least Squares in Surveying and GIS. Toronto: John Wiley & Sons.